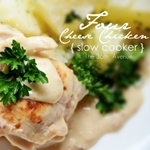 I am sharing with you today one of our favorite Slow Cooker Recipes. 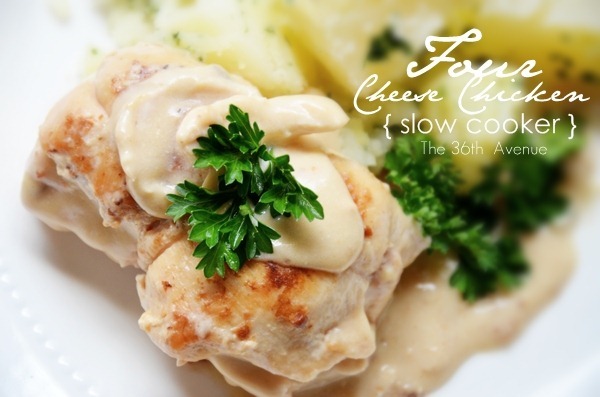 Take a look at our Four Cheese Chicken. This chicken is so good. 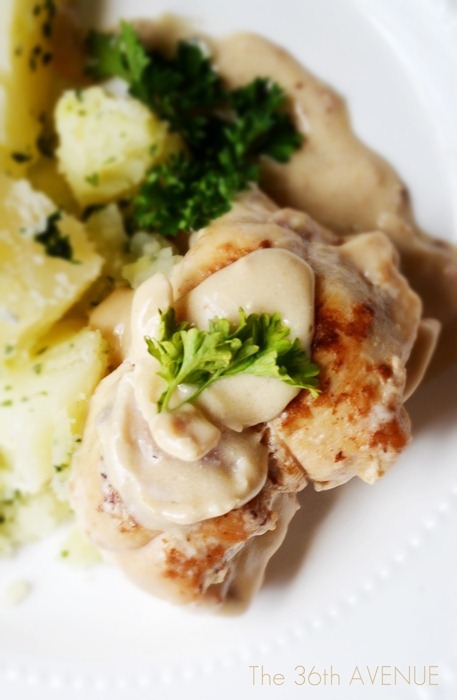 It has a deep delicious rich taste and the sauce is creamy and full of flavor. In a pan cook the bacon to your like and chop it into small pieces. Put the pan aside since you are going to use it again. In a bowl mix the soft cream cheese, the crumbled Blue and Feta Cheese, and the bacon. Put it aside. Filet the chicken in half. Lay the chicken between 2 pieces of plastic wrap. Using the flat side of a meat mallet, gently pound the chicken to ¼-inch thickness. Take care not to pound too hard because the meat may tear or create holes. Add to the center of the chicken some of the mixture. Roll the chicken and use some baker's twine to hold it together. Repeat until you have done all the chicken. Place the parmesan cheese on a plate and gently coat the chicken in it. Lightly brown the chicken in the bacon pan. Empty the can of mushroon soup on the botton of he crock pot, then place on top of the golden browned chicken. Let it cook on high for about two hours and then for another one and half hour on low. I like to serve the chicken with potatoes and salad. Oh my goodness, I made your four cheese chicken a few nights ago and I have been wanting some ever since. This is a wonderful recipe! Yummy, thanks for sharing! Looks so delicious….thanks for sharing!! This looks so yummy and sounds delicious! Sounds great to me!! I know it’s fabulous since your Fiesta Ranch Slow Cooker Chicken has become one of my family’s favorites. Gina this one is as good if not better. Give it a try!